Pavement settlement occurring in and around utility cuts is a common problem, resulting in uneven pavement surfaces, annoyance to drivers, and ultimately, further maintenance. A survey of municipal authorities and field and laboratory investigations were conducted to identify the factors contributing to the settlement of utility cut restorations in pavement sections. Survey responses were received from seven cities across Iowa and indicate that utility cut restorations often last less than two years. Observations made during site inspections showed that backfill material varies from one city to another, backfill lift thickness often exceeds 12 inches, and the backfill material is often placed at bulking moisture contents with no Quality control/Quality Assurance. Laboratory investigation of the backfill materials indicate that at the field moisture contents encountered, the backfill materials have collapse potentials up to 35%. Falling Weight Deflectometer (FWD) deflection data and elevation shots indicate that the maximum deflection in the pavement occurs in the area around the utility cut restoration. The FWD data indicate a zone of influence around the perimeter of the restoration extending two to three feet beyond the trench perimeter. The research team proposes moisture control, the use of 65% relative density in a granular fill, and removing and compacting the native material near the ground surface around the trench. 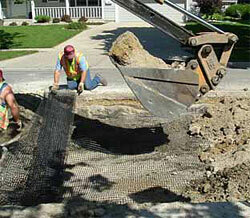 Test sections with geogrid reinforcement were also incorporated. The performance of inspected and proposed utility cuts needs to be monitored for at least two more years.